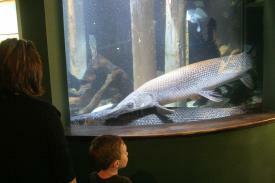 Alligator Gar - Fishes of Oklahoma Exhibit: Oklahoma Aquarium in Jenks, Oklahoma south of Tulsa Tigger Travels - Family Adventure Journal Photos From Tigger`s Travels and MORE! Having lived near Alligators (some very large) for the past decade, I did not know what to expect from viewing Oklahoma's Alligator Gar. Some species of Gar get pretty big, and this was not exception! 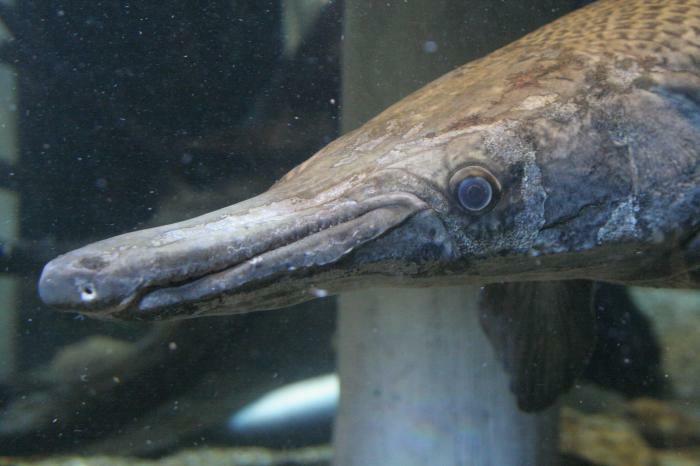 This handsome fellow has a double row of teeth on his upper bill, which is not found on any other species of Gar. That alone was enough to instill some respect, but the size blew me away! They grow in Oklahoma to be five to almost eight feet long! That is 50 to 180 pounds of chomping power. A state record held by Deryl Landers was caught on a rod and line in the Red River in July 2002. It measured 93 1/4 inches long and weighted 180 pounds! The record was broken in February 2006 by Sean Chatham at the same river in Love, Oklahoma. His catch measured only 92 inches but weighted in at over 184 pounds! 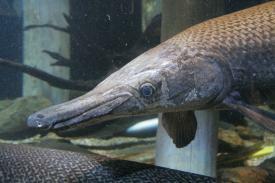 The Alligator Gar is a large, Jurassic Age fish whose population status is uncertain, and is infrequently caught by anglers using bow fishing or snagging methods.